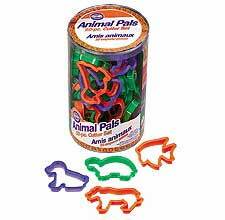 Everyone will go wild for cookies, foods and crafts made with this menagerie of 50 favorite animal shapes. Shapes include fish, dog, cat, birds, butterflies, reptiles and more. Plastic cutters are 3 inch. Recipe included.